Looking towards a hut with an extended thatch over the entrance way to provide shade and rain protection near the doorway. The film number suggests that this homestead was photographed among the Lou, who Evans-Pritchard revisited at Yakwach during the rains in July 1935. Note on print reverse ms pencil - "64 4 A169" & print front border ms ink - "NUER III/50"
Morton, Chris. 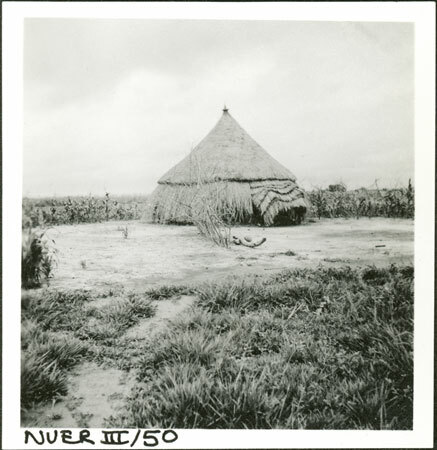 "A Nuer homestead" Southern Sudan Project (in development). 03 Jan. 2006. Pitt Rivers Museum. <http://southernsudan.prm.ox.ac.uk/details/1998.355.124.2/>.